I just found an interview with Stanley Kubrick conducted by Jeremy Bernstein in November 27, 1966. Kubrick never liked interviews therefore we have so few with him. This one is quite interesting. In 1966, Kubrick had just finished Dr. Strangelove and was working for his new feature, an adaptation from an Arthur C. Clark novel, A Space Odyssey: 2001. With the exception of a few directors, like David Lean and, well let’s not say who, but with the exception of a few directors, most people have their film edited by film editors as they go along. And then, when the film is done, they look at the film and dictate some notes about it and the film editor tries to do what they say and then maybe they look at it again and they do it again. But basically it’s like trying to, say, redesign a city by driving through it in a car, you know. You can notice a few things and say, you know, “put that traffic light in the middle of the street” or “those buildings over there look kind of shabby” or something, but if you really want to do it right, you must do it yourself, you know, piece by piece. So, I think by now I have enough, sort of, ability to imagine the way a scene will come out so that I can tell without editing the material if I have enough film coverage and, you know, what I can do with it, and then I edit the film with the editor myself when the film is… when I’m all finished. 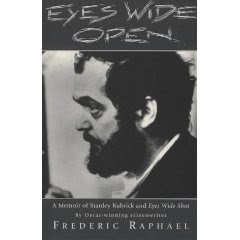 I would also like to mention a wonderful book about Stanley Kubrick "Eyes Wide Open" written by Frederic Raphael who wrote the screenplay of Eyes Wide Shut. The book is about his collaboration with the director while working on the screenplay in the early 90's. It was just published after the death of Kubrick and the release of the film in 1999. However Kubrick family set against the book because it was published without their permission and the family accused him for not having respect for privacy and writing a memoir on Kubrick with inaccurate information. After a very long search, a friend of mine found the book for me in New York and gave it to me. Although I am not sure about the accuracy of information written in the book, I just love this piece of dialog. S.K. : I don't know. We can talk about that. We'll have to. Do you want to work on it or not? F.R. : Of course I do. I was afraid it might be science fiction. S.K. : Don't you like science fiction? F.R. : I never read it. I never feel remotely interested in people who are going to be alive three centuries after I'm dead, do you? S.K. : I don't know about people. Situations, yes!